Many of us wonder about that cool rock we kicked up on the shore of Lake Michigan, or the weird-looking bird we once snapped a picture of. 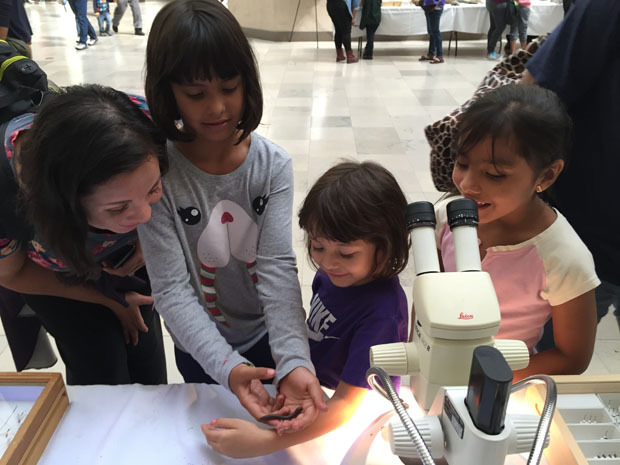 That’s why the Field Museum of Natural History in Chicago held its second annual ID Day — so people could bring in specimens and have them identified by experts. Just past the ticket counter, the normally wide-open space had tables for each category — insects, rocks, birds, mammals, and fossils, to name a few — and lines snaked along. Paul Mayer is the museum’s fossil invertebrate collection manager. He said his record ID&apos;ing things for the day wasn’t too bad. David Keenan, 19, brought in two cigar boxes full of “other things” — in this case, tiny coin-shaped plant fossils with star-shaped bursts inside them. Mayer was totally stumped. Which means Keenan got to take an “I Stumped a Scientist!” sticker that was on hand. Keenan, for his part, wasn&apos;t disappointed by the mystery. Instead, he was even more intrigued by his unknown fossils. “I don’t know, it’s just encaptured beauty, I guess? Like, flowers and stuff from an age long forgotten. Like, it’s way longer than we’re gonna last,“ Keenan said. Jim Holstein manages the mineral collection for the Field Museum. That means he’s the guy who has to tell everyone their special rocks are not, in fact, that special. But Holstein says 99 percent of the people who come for IDs are willing to accept the truth. But that 1 percent is tenacious. “Some people, you cannot convince them otherwise, They have their hearts set." A museum spokesperson said about two thousand people came to ID Day. Greta Johnsen is a WBEZ anchor/reporter. Follow her @gretamjohnsen.